Ridgefield defeated Trumbull 73-66 in a FCIAC semifinal boys basketball game at Wilton High School on Tuesday, Feb. 26, 2019 in Wilton, Connecticut. The No. 3 Hatters used a 16-0 run in the first quarter to establish dominance and never let No. 2 Wilton up for air, winning 68-48 in the FCIAC semifinals at Wilton Field House. The defending FCIAC champions will face the winner of the nightcap between No. 7 Ridgefield and No. 1 Trumbull in the championship game Thursday night at 7 p.m. back at the field house. Danbury beat Trumbull in the title game last season. Danbury coach Casey Bock said the experience of playing in the final a year ago certainly helped his team maintain composure in a raucous environment. Wilton was out of sync from the start, missing shots from both inside and out and Danbury was more than happy to pounce, going up 11 after one quarter and 33-16 at the half. Jah Joyner had 19 points, leading the Hatters with Denali Burton adding 15 as the two big men did work inside. For Wilton, Kyle Hyzy led the way with nine points. Wilton’s 48 points marked only the second time the Warriors were held below 50 all season. Javon Hernandez, Danbury. Hernandez scored 17 points but was most valuable breaking the Wilton press, dribbling or passing his way out of traps without much resistance. The Ridgefield boys basketball team has had a string of success the last few seasons, including winning a FCIAC championship in 2017, but the run to reach this year’s final is a little more special for James St. Pierre and the seniors. No. 5 Ridgefield started on fire and held on down the stretch, beating No. 1 Trumbull at Wilton Field House. The Tigers will take on No. 3 Danbury, the 2018 titlists, in the championship game Thursday at 7 p.m. at the Field House. Ridgefield used a 15-2 run in the first quarter, opening up an eight-point lead after one quarter. Trumbull would claw back, but never get closer than six points. 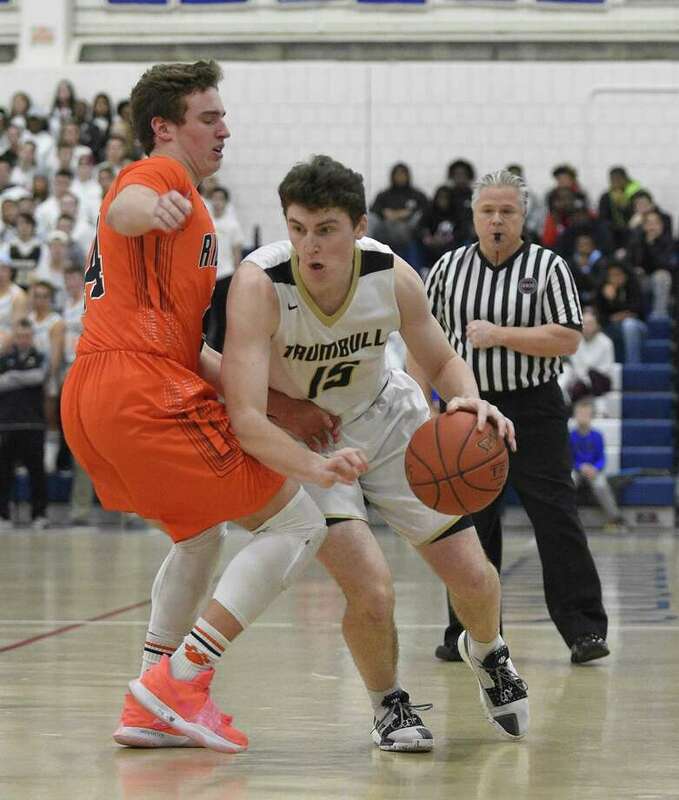 The Ridgefield defense locked down Trumbull’s two leading scorers with St. Pierre holding down Timmond Williams and Chris Knachel covering Chris Brown. Brown finished with 14 points and Williams 17 on just three field goals, both below their season averages. Knachel also knocked down four big free throws in the fourth quarter as Trumbull was attempting its comeback. The junior forward finished with 20 points. James St. Pierre, Ridgefield. St. Pierre scored a game-high 23 points while also locking up Williams on defense.